This wireless, sculpted, clay wall sconce looks like metal wall decor you might find in Tuscany. This is an easy project to create when you have clay on hand. No electricity is needed. Battery operated string lights sit in the velum cone and shed a surprising amount of light on the wall. The cone rests in the antiqued copper clay sconce which acts as a functional as well as attractive wall decor. So easy and elegant you may want to make a sconce set! step 1 - Cut a Quaker oats container in half using scissors. Follow the line down each side. Pull off the container bottom. Overlap the bottom edges of the container and staple them together. Peel off the label and smooth aluminum foil over the container. The front should be slightly curved and the backside flat. step 2 - Condition 2 oz. 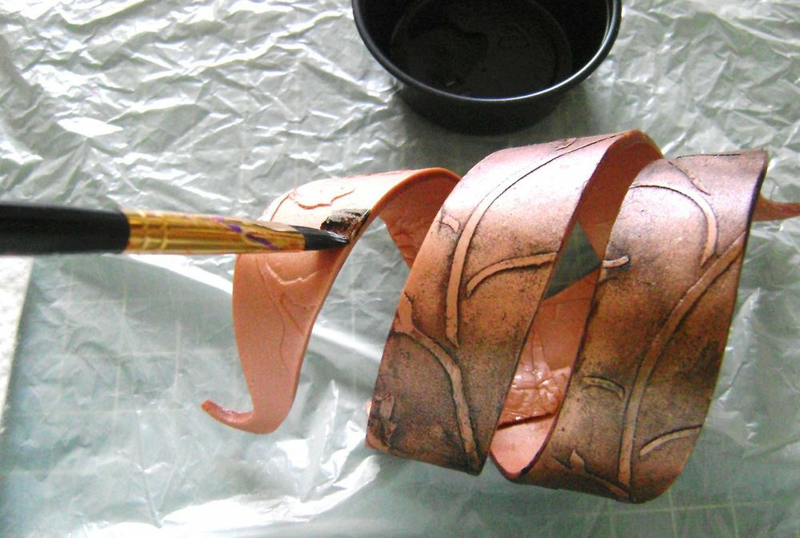 of Copper clay on the thickest setting of a clay conditioning machine. Cut the clay into one-inch strips. Place the stencil on the clay and roll over it to transfer the design to the clay. Cut into three strips measuring 7/8” wide and 7”, 8” and 6” long. Use clay-shaping tools to create a curl on the upper and lower strip ends. step 3 - Drape the clay strips over the container bringing the flat edges to the center backside. When all three are positioned with equal distance between them and curving across the front of the container, press the back edges together to join them. If they aren't long enough, add another piece of clay where necessary. step 4 - Cut a thick piece of clay measuring about 2” square. With clay shaping tools, make a hole to accommodate the size nail or screw you will be using to hang the sconce. step 5 - Bake the hanger and the sconce with the curved side up at 275 degrees for 30 minutes on a foil lined baking sheet. Allow the clay to cool before handling. step 6 - Cut three cones, one from a stencil blank, which will provide support; one from regular paper, which will diffuse the lights; and one from eggshell toned vellum paper for aesthetics. Each cone should measure 6.50” square. One cone at a time, place the side edges together and join them with transparent tape. Place the cones inside each other with the vellum cone on the outside. If one cone is slightly longer than another when stacked, trim it from the top edge. step 7 - With a brush, working in small sections, apply a wash to the clay. Make the wash from a little water and acrylic black paint. Wipe away the paint immediately from raised areas with a soft cloth. step 8 - Glue the hanger onto the back of the sconce using Aleene’s Turbo tacky glue and allow it to dry. step 9 - Hang the sconce on the wall. Set the cone into the clay. Set the battery pack into the cone and arrange the lights inside. Position the switch for the battery pack near the top so it is handy to access. Premo copper clay - 2 oz.